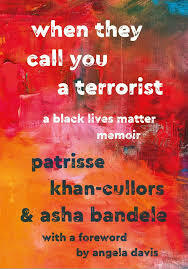 “When They Call You A Terrorist,” by Patrisse Khan-Cullors and co-authored by Asha Bandele, has been chosen for NIU’s 2019-2021 Common Reading Experience (CRE). Last year, over 70 percent of freshmen students used the book in at least one of their courses, including UNIV 101/201, First-Year Composition courses and COMS 100. The Office of the Vice Provost for Undergraduate Academic Affairs strongly recommends other colleges and departmental courses to consider incorporating the book or themes from the book into their course content. Get a copy of the book! The book, which was recommended by a team of faculty, staff community members and students from a group of approximately 20 titles, will also be available to check out from First- and Second-Year Experience (FSYE) in Altgeld Hall 100, on Wednesday, May 1. Submit an existing or new idea for a program related to a theme from this year’s book. FSYE will help to coordinate and market your event! Interested in helping make decisions regarding CRE curriculum, collaborative partners and programming? Email or call 815-753-0028 and let FSYE know! “Raised by a single mother in an impoverished neighborhood in Los Angeles, Patrisse Khan-Cullors experienced firsthand the prejudice and persecution Black Americans endure at the hands of law enforcement. For Patrisse, the most vulnerable people in the country are black people. Deliberately and ruthlessly targeted by a criminal justice system serving a white-privilege agenda, black people are subjected to unjustifiable racial profiling and police brutality. In 2013, when Trayvon Martin’s killer went free, Patrisse’s outrage led her to co-found Black Lives Matter with Alicia Garza and Opal Tometi. “Condemned as terrorists and as a threat to America, these loving women founded a hashtag that birthed the movement to demand accountability from the authorities who continually turn a blind eye to the injustices inflicted upon people of black and brown skin. “Championing human rights in the face of violent racism, Patrisse is a survivor. She transformed her personal pain into political power, giving voice to a people suffering inequality and a movement fueled by her strength and love to tell the country—and the world—that Black Lives Matter. The book emphasizes themes of mental health, poverty, race, criminal justice system inequities, activism, social economic status, addiction, food insecurity, gender-identity issues, religion/spirituality, oppression, intersectionality, educational access and barriers, relationships and blended families. The book also addresses transgender and women’s issues as well as immigration issues. For more information, visit go.niu.edu/CRE or contact FSYE by phone at 815-753-0028 or fsye@niu.edu.